Дополнение: Хронограф. Запас хода до 60 часов. Задняя крышка прозрачная. Простая стальная застежка. Size:	Mens Case Material:	Ceramic Dial Color:	Black Bracelet/Strap:	Fabric Black Clasp Type:	Tang Buckle Movement:	Automatic Chronograph - Chronometer Screw Down Crown:	Yes Bezel:	Fixed Crystal:	Anti-Reflective Scratch Resistant Sapphire Case Back:	Transparent Water Resistant	50m/150ft Case Diameter: 44.25mm Case Thickness:	16.50mm Brushed/Satin finished black ceramic case with polished finished beveled edges. Polished black ceramic crown with the omega logo engraved. Polished black ceramic chronograph buttons. Polished black ceramic bezel with an engraved & matt chromium nitride filled tachymeter scale. Dial: High gloss black zirconium oxide ceramic main dial & sub-dials. Sub-dials surrounded with raised black rims with very fine printed silver colored indexes. Applied white gold polished index hour markers with luminescent fill. Printed silver colored minute/seconds & fractions of a second track. [ZrO2] engraved on the dial directly above the center hands. Polished white gold hands with luminescent fill. Chronograph Stopwatch functions: Large red tipped central seconds hand counter. Minute & hour counters are combined into a single sub-dial located at the 3 o'clock position. The hour hand is of orange aluminum & the minute hand is polished steel - both with luminescent fill. Small continuous running seconds hand sub-dial located at the 9 o'clock position. Date window displayed at the 6 o'clock position. Domed sapphire crystal on front & back. Case back engraved with "DARK SIDE OF THE MOON - Si 14 - ZrO2" Polished black zirconium oxide ceramic pin buckle. Movement: Omega caliber 9300, beats at 28,800 vph, contains 54 Jewels & has an approximate power reserve of 60 hours - thanks to its twin barrels mounted in series. Column-Wheel Chronograph - column wheel is visible from the transparent case back. The movement features Omega's "Si 14" silicon balance spring, which contributes to the movements outstanding resistance to shock and to environmental disturbances and thus, to the watch’s chronometric performance. The movement also features the now-standard Co-Axial Escapement which contributes to greater precision, stability & durability. The Co-Axial escapement has less friction & reduces the necessity of lubrication thus reducing the time required between servicing. The combination of the SI 14 balance spring & the Co-Axial escapement makes for an extremely reliable & stable movement. The rotor & visible bridges are decorated with a unique "arabesque" wave design finish. 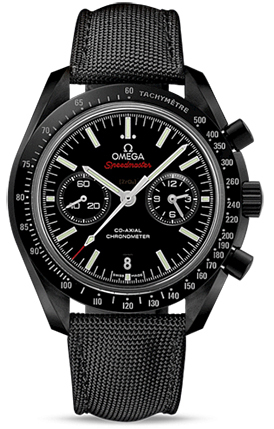 Есть вопросы по Omega Speedmaster Moonwatch Co-Axial Chronograph 44,25 311.92.44.51.01.003?